Recently I was “enticed” to Milan by a friend who was attending a tradeshow in the city. Honestly, I had not given much priority to visiting Milan because I am drawn to the undeniable beauty of Florence and Venice and the majesty of Rome. But I will never say no to a trip to Italy. I was expecting a big, industrial city and Milan is certainly that. What I had not anticipated was a city that owed so much of its past to one of the most important figures the world has ever known. Leonardo da Vinci is everywhere in Milan and this proved to be a theme as I explored the city. 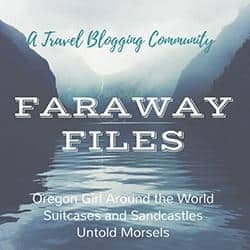 Thanks to everyone who joined the Faraway Files link up last week. As always I loved reading your stories but funnily enough, I was drawn to those posts on areas we are planning to visit in the coming months. Norway is a place I have always wanted to visit since my cousin went there as an exchange student and brought me back a Viking boat necklace. Nell’s breathtaking photos of Flåm and Stegastein made me gasp at their sheer beauty. As a result, we are now actively planning a trip to that region later in the year. Champagne anyone? I only need one reason to visit the Champagne region of France but Ruth gave us 9! This region is near the top of my list of places to visit in France. I cannot wait to explore those caves. I loved reading Bryna’s account of the Amalfi Coast on a rainy day in winter. All the images you see of that area of Italy are of its picturesque shores bathed in sunlight. Bryna was able to convey a different kind of beauty with her beautiful photos and insight. Staying in Italy (of course! ), this week I am sharing my post on discovering the Milan of Leonardo da Vinci. The great artist and scientist was born in Florence but had an enormous impact on the city of Milan – from its food culture to its system of canals. So happy to be able to comment again that I’m just gonna do it! Thanks for hosting!! Woot woot! Let’s go somewhere! Loving the links already up – can’t wait to see where in the world we go today! Love ya work and endless enthusiasm Erin ? Thank you for featuring my post as one of your favourites, Katy! Hello Katy, thanks for the mention. Glad you are discovering new places. I have been to Milan but didn’t have a lo to f time to explore. Have a great weekend!